The School of Art at Montana State University in conjunction with SLAM is pleased to announce the opening of “Zack Babat: Works from 2008- 2016” at the Helen E. Copeland located on the second floor of the School of Art in Haynes Hall, Bozeman MT. The show will be on exhibit Wednesday, July 19th – Friday, July 28th, 2017. Though the exhibition is brief, please come celebrate the life of the work of the late Zack Babat, who passed last year during a plane crash. He was 44. This is surely a show for which to make time from a busy day. Babat was a professional painter in Southwestern Montana. The animals of the American west are his great love. His inspiration came from his time spent guiding in Montana and Alaska. Babat painted exclusively with water media, drawing from his life’s experiences in the outdoors. Babat started painting in 2008 and was self-taught finding his while flying and guiding in Alaska and Montana. He loved to paint the personality of the animal, not just the horns, claws or fins; he believed the personalities is what made the animals of the West magnificent. Babat’s artwork brings joy and sometimes laughter to all who have the pleasure of viewing it. His artwork has been selected for the CM Russell Art Auction and he painted at the National Wildlife Art Museum Plein Air. According to local esteemed artist DG House: During my 22 year career as a full time professional painter, I can look to a handful of fellow wildlife artists who are working at the highest level. Zach Babat was on the top of the list. When I told people they needed to see his work I’d always say because he’s the real deal. However, I know they didn’t need to hear it from me. All you had to do is look at the work. Out in nature, there are various stories going on all around you all the time. Zach knew how to capture these moments in one piece and marry them together into one big story. He was the master of this because of the years he was immersed in the wild lands of the West. He was my colleague, my art compadre and a talent rarely seen. Zach, a cherished Montana artist located in Whitehall, was originally from New York and painted exclusively in water media. He also worked as a hunting guide and was a bush pilot in Alaska for a time. Unfortunately, at the age off 44, he met an untimely death in a plane crash last September in a mid-air collision. 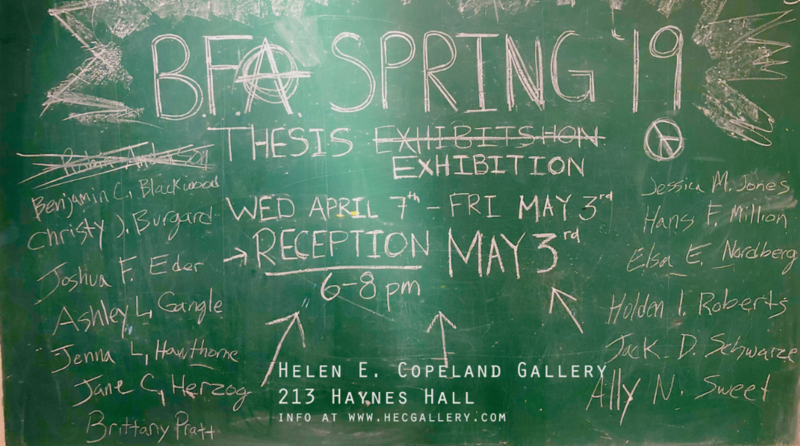 The School of Arts, Helen E. Copeland Gallery, and SLAM are so happy to display the work of this skillful artist. SLAM (Support Local Artists and Musicians) is a non-profit dedicated to education in the arts, and promoting and showcasing the artistic, performance and musical talents of the state in an environment that enriches and involves the community. Currently, SLAM sponsors scholarships for high school students, bike racks that by local artists, our bi-yearly art festivals, and now, our new art space. Also on view in the HECG is “From the Vault—Prints and works on Paper from the Archives.” On view are works from the MSU School of Arts Archives. Most of the works are prints, including the works of Dufy, Fran Noel, Gesine Janzen, F.G. Grunger, and selections from a London Print exchange organized by Robert Rohyl, and works from the 2008 Mid America Print Council Conference entitled, “What!? A Woodblock?” Also on display are Japanese woodblock prints and silk screens believed to be donated by Olga Ross Hannon.